On 4th March 2016, BNMT Team along with our Trustee, Dr. Gillian Holdsworth visited Education and Development for the Underprivileged Children (EDUC), Basundhara for art counseling. Dr. Gillian was happy to see the children being happy and enjoying their work in school even after the devastating earthquake in Nepal. BNMT team was glad to support those children financially even though the amount was not so big. 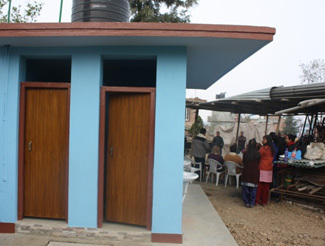 On 4th March, 2016 BNMT Team Nepal visited Lalitpur, Municipality-12, Bungamati for handover of newly constructed four compartment gender friendly community toilet implemented by Rotract club of Metro City and funded by Handle with Care International, Australia. 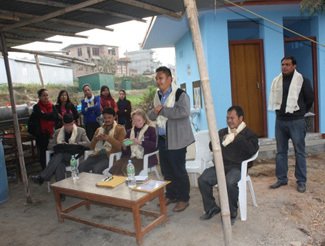 The programme started by welcoming and chairing the guests of the day Dr. Gillian Holdsworth, the co-chair of the BNMT UK Board of Trustees, Mr. Suman Chandra Gurung, director of BNMT Nepal and Mr. Madhukar Tuladhar, Principal of Tri- Ratna Cooperative Secondary School. Mr. Rajan Maharjan, Past President of Rotaract club of Metro city. Right after the chairing, Mr. Rajan Maharjan thanked and expressed his gratitude to BNMT Nepal for the toilet construction initiative. 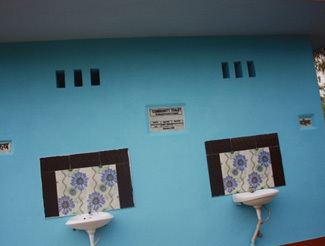 He then added about the need of community toilet in his surrounding where it still lacks the personal toilet. At the end, he concluded proper use of toilet will maintain personal health and hygiene and will prevent many diseases like diarrohoea, dysentery, etc and requested the toilet users’ community to keep it always clean. At the end of the session, Dr. Gillian Holdsworth presented with token of love and handed over the gender friendly community toilet to Lalitpur Municipality. 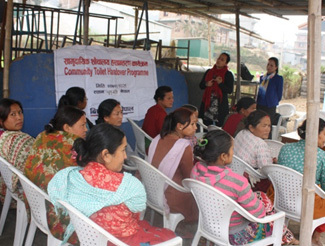 After handover session, Mr. Raghu Dhital, WASH Programme Coordinator hosted the community toilet handover programme. 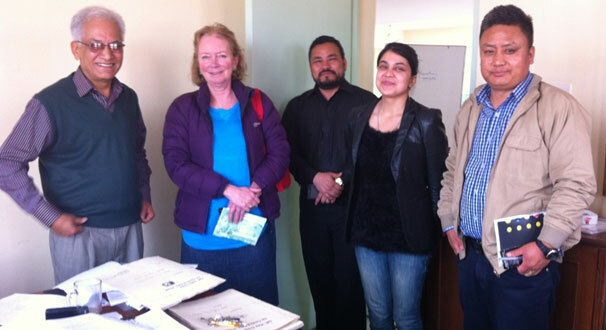 On 3rd of March 2016, Dr. Gillian Holdsworth, Trustee of BNMT UK, Mr. Suman Chandra Gurung, Program Director of BNMT and Ms. Shikha Upadhyaya Khatiwada, Psychosocial Counselor visited Self-Help Group for Cerebral Palsy (SGCP), Nepal Makhundole, Dhapakhel, and met the CEO of SGCP Mr. Bimal Lal Shrestha. He shared his knowledge about three interventions done to the Cerebral Palsy (CP) children in his organization where they do 1) clinical checkup of the children 2) schooling of children and vocational training to them 3) home visit of the CP children and interaction with the parents in some place they have establish day care centers too. 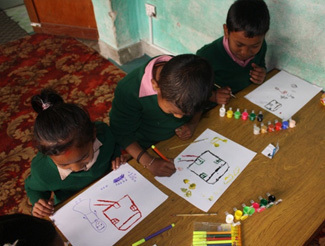 SGCP also provide income generating skills to the parents of the CP children so that they can sustain in future. Dr. Gillian along with the BNMT Team also visited the OPD patient’s room, physiotherapy room, and speech therapy room and interacted with the patients. The different classes of SGCP including vocational and computer classes were interesting and Dr. Gillian was happy to be with them and taking back the smile she saw in their face along with her back to UK. 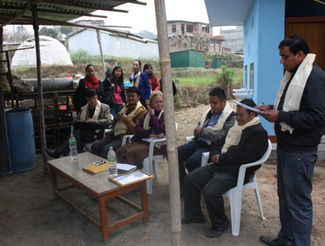 Grant Agreement has been signed between AmeriCares Foundation, Inc. And Birat Nepal Medical Trust (BNMT Nepal) on January 27, 2016 for Post-Earthquake Health Sector Recovery and Reconstruction Support in Makawanpur District, Nepal – Type Design 1: Health Post for Post-Disaster Reconstruction. The agreement was signed by our Programme Director, Mr. Suman Chandra Gurung and Nepal Team Leader Mr. Riaz Khalil of AmeriCares. The project has been started effective from February 2016. On 20th January, 2016 BNMT handed over essential medicines to Mother Land Hospital, Bhaktapur. Woke to more rain. Pasang’s (Rosie’s porter) wife turned up with a bottle of raksi (local spirit) for our early morning drinking! Morning drinking is quite common in Nepal and not always very beneficial to either the individual or their family. We remonstrated with Pasdang’s wife – to no effect – she obviously thought that raksi was just the ticket before our 500 metre drop down to the river on a slippery muddy path! However, we managed to secrete our spirit away without having to consume it! We left for Chainpur on the Ling Ling path and passed two British Gurkhas and their porter en route to Khadbari. Twenty years ago it was common to meet British Gurkhas escorting the delivery of the Gurkha pensions, in cash to the district centre bank. It appears that this is now done electronically. 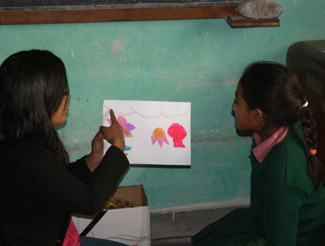 These two were on a trip to review some of the projects supported by Gurkha Welfare. These would include such capital projects as bridge building and drinking water supply. Rosie’s tendon is still giving her jip but we managed to buy some codeine/paracetamol mix which seems to have done the trick, otherwise we may not all make Olangchung Gola! After lunch in Nundhaki we climbed steeply for three hours to Gufa Pokhari at 2,900m. Gufa Pokhari is a small Sherpa settlement on the Milke Darra ridge with stunning views of the Himalaya on both sides. The Kanchenjunga and Jannu Himal massif to the east and Makalu and Everest to the west – when it is clear! There had been a three day festival in the village culminating this afternoon with a football match between Basantapur and Gufa Pokhari. Basantapur apparently won 12-1, so there was much celebrating among the Basantapur team and their supporters. Suresh Lama, who had worked with me as a health post visitor in Phidim and later gone on to become the Clinic-in-charge in Taplejung, had come to meet us in Gufa with his friend, Dipok Subbha. Dipok’s father was in the British Army and now lives and works in Hong Kong and is home on holiday. It was Suresh’s birthday so with lots of things to celebrate (birthday, arrival in Taplejung district and of course the Basantapur football team’s result) we had an evening of tongba (local millet beer) and singing and dancing. We sang “God save the Queen” for them – on request!!! Woke to a complete whiteout – no mountains to be seen at all. I think Jacky is beginning to wonder if there really are mountains here at all! After a knee jarring 1,500m descent, during which we gleaned fleeting glimpses of Kanchenjunga (the World’s third highest mountain) like a shy bride behind her diaphanous veil, we arrived at Dobhan on the banks of the Tamur River. I had to call my credit card company as apparently there were some problems with my account. I had been given a “call collect” number to dial and embarked on the process of making an international call on a CDM phone (which I think is a wireless network in the hills here) which requires strategic placement of the phone and its aerial in what appears to be the one place where they receive a signal in the village. This happened to be in the middle of the main street, about 8 feet up and required the shop owner to stand on a chair holding the telephone in the air, while I talked to a very patient woman on an incredibly broken line about my account. This spectacle immediately attracted a large crowd, all discussing loudly and animatedly about what I was doing, what I was saying and what country I was from! Having ascertained that the problem was the credit card company’s mistake, she wanted to call me back, “in a couple of days time” to confirm they had sorted it??!! I suggested that this communication may have to wait until I had access to a better network! I then embarked on the process of explaining the concept of “collect calls” to the shopkeeper but she was not having any of it and so I got stung for 1,800 Rupees! We stayed overnight at the “Hideaway” resort in a safari tent with a river thundering past on both sides. Today is Laxmi Puja, the third day of the Tihar holiday and for those of you who have followed my blog, the day when I have to tie my “dora” (see August 28) around the tail of a cow! Luckily there were three cows tethered as we left the Hideaway resort in the morning and their owner was happy for me to divest myself of my “dora” on one of his animals, although he recommended a “malla” (necklace) rather than the tail! We took the main trekking route from Dobhan towards Kanchenjunga which proved to be a jungle obstacle course of Himalayan proportions. We were all rather relieved when we arrived in Mitlung for lunch, knowing that the path ahead was much more manageable! We over-nighted in Sirwa where we participated in “Dosi”. During the Tihar festival groups of local children visit all the houses in the village in the evening and provide a display of singing and dancing for which they are rewarded with food and money. This is known as “Dosi kelnu”. Tonight, as part of the celebrations for “Laxmi puja” (Laxmi is the goddess of wealth) all the houses have lighted candles and oil lamps outside and the main street looked quite magical. We stopped for lunch in Chiriwa. The last time we came through here Rosie and I met an old Gurkha who had fought at Gallipoli and who regaled us with stories of his European journey post war. This time we met another Maoist. Unfortunately for him we are quite well practiced now in dealing with their requests and he went away empty handed! We continued along the Tamur river valley, through groves of cardamom plants. Black cardamom is an important cash crop in eastern Nepal and it is exported in large quantities to India where it is used in Ayurvedic medicine. In eastern Nepal they also grow a lot of tea and coffee and overall the east is much more prosperous than the far west, where I started my trek. We arrived in Lungthung and stayed at the Yangla hotel, in the smallest double bedroom ever. Rosie and I wondered if the room had been built around the bed! There was a guide from another trekking group already there when we arrived but he had lost his group which seemed a rather extraordinary (and possibly unprofessional) feat! So we sent him off to find them. We spent the evening playing Dosi again. We had three groups of singing and dancing tonight, raising money for local community projects. Our rather drunk host, Rinjin Dorje, remonstrated with us over our apparent “lack of generosity” and the evening proved rather expensive! We continued up the Tamur river valley. We are now much higher and the river drops steeply in places with spectacular waterfalls. KCAP (Kanchenjung Conservation Area Project) had embarked on a programme of bridge building in this valley since we were last here, so we walked up the eastern bank of the river (instead of the western, as we did before). This is the route along which the Nepal government of the time sent a wedding present of two elephants to King Songsten Gyampo of Tibet on his marriage to Princess Bhrikuti of Nepal – it is unlikely that they survived! We stopped at the top of the valley where some people from Olangchung Gola were pasturing their Yaks. We sat with them and drank warm Yak’s milk which was incredibly creamy and a bit sweet – some additional energy before our last haul up to Olangchung Gola. On arrival at Olangchung Gola we checked in at Jumba did’s. Jumba didi is the grandmother of Pema Donga, who I sponsor at school in Taplejung. Pema Donga is home for the Dasain and Tihar holiday with her grandmother. Another riotous evening of tongba and singing and dancing, (including the famous foot stamping Sherpa dance) before we bedded down in the family ‘larder’– currently home to a couple of dead Yaks hanging and a copious supply of Churpi (the locally made cheese guaranteed to break your teeth) …… another ‘des res’! Olangchung Gola is a substantial village of wooden houses located in a bowl at 3,200m. There is a large monastery, the Diki Choling monastery, reputed to be the oldest Tibetan monastery in Nepal. Originally it was located a day’s walk up the valley. It was rebuilt in the village in 1860 and currently hosts seven Lamas, most of who appear to be quite elderly. They are the Nyingmapa sect which allows them to be married as well as exercising their religious duties. Olangchung Gola had been a prosperous village in the past, strategically located on one of the important trading routes between Tibet and Nepal. This economy was pretty much shattered by the Chinese occupation of Tibet and although trading still continues to a much lesser extent, many of the Olangchung Gola families have moved away to sustain themselves and there is a not insignificant number of them in New York! Having arrived in Olangchung Gola as a group of nine we left as a group of eleven, plus three dogs!! Michael (one year old) and Tilly and Lassie (three month old pups) are all Tibetan mastiffs. Tibetan mastiffs are big fierce dogs used in the high mountains to protect the livestock from predators. Tilly and Lassie, understandably reluctant to leave their mother, had to be carried until lunchtime which significantly slowed our progress! Every village we passed through created howls of consternation from the local hounds but Michael saw off the lowland dogs briskly!! At lunch, in Hiladarra, Michael, anxious to “have a go” at the house dog, jumped over the balcony on his chain and had to be hauled back up by the boys! We finally arrived in Lelep – another balcony for the dogs – where Michael was positioned so he could not jump over the balcony and the balcony barricaded so that Lassie and Tilly couldn’t wander. This made night time toilet trips even more hazardous!! We started the day with tea and Chinese army biscuits – a leaving present from Jumba didi in Olangchung Gola! Chinese army biscuits look a bit like MDF board (and probably taste a bit like it too!) and one biscuit is supposed to fill you for the day. The dogs meanwhile breakfasted on tsampa (barley flour) which is the dog food of choice for that particular breed …. A bit different from Purina! Michael took a bite out of Tilly’s ear which resulted in much squealing, before we hit the road again heading for Tapethok for an early lunch. Tapethok was considered a ‘dog free zone’ which was considered preferable for our entourage! We continued on to Mitlung where we availed ourselves of their bathroom for a much needed shower, interestingly constructed without a door!! The owner kindly provided us with a ‘modesty curtain’! We then embarked on ‘end of trek’ celebrations which included the massacre of another chicken and more singing and dancing. We left Mitlung for Taplejung – a three hour uphill climb which we do in the cool and shade of the early morning. Stopped for a snack below the high school. Michael, Tilly and Lassie still causing huge local canine excitement and a pile up of school children below – afraid of passing them in case they got bitten!! During our snack stop one enlightened gentleman, who had consumed a not insignificant amount of jaard (millet beer) asked if we were from Korea! He was sure that Rosie looked just like a Korean as he had worked there and apparently knew what Koreans look like! Amazing the power of alcohol to distort!! We arrived in Taplejung at 11am – the end of the “Noble Trek” and I have made it! At the start I sometimes wondered if I could actually complete it – but I have!! For those of you have become blog addicts and want to ask – the best bit …..there were many!! And the worst bit – I am almost certain will be the bus ride south from Taplejung to Biratnagar in the coming days! So – in the words of Suresh Lama ….”now I am going to stop my pen!” but not before thanking you all for your texts (sorry I couldn’t reply! ), support and sponsorship. And a special thank you to Sonam Sherpa (my porter) without whom I most certainly would not have made it. It was an amazing experience. Left Phaplu for Booridarra- Glorious weather and a truly flat path. Nepalis will frequently tell you that the path is flat but as yet I have never found one! We stopped for lunch in Nelai and then climbed up on to the Lekh before dropping down to Booridarra. We walked from Booridarra to Sotang. We dropped steeply down to the Dudhkoshi River, crossing a long suspension bridge. There was a young boy leading his elderly parents across. They were embarking on a pilgrimage to a holy place in India and were afraid to cross the bridge alone. We followed the Ungu river valley heading north. This area is the home of the Kulung Rai, a sub-group of Rai who are renowned for their portering activities around Everest region, as well as working in the British Army. We stopped at a small Sherpa lodge in Sotang for the night run by a delightful Sherpa lady with her two children. Her husband had worked as a trekking guide but left to work in Israel two years ago because work was scarce in Nepal. They have not heard from him since. “There is no greater vision of hell than the view from Bung to Gudel”. A quote of Shipton on one of his trips to Everest and one that kept Rosie Blandy’s brother Richard amused ten years ago as he walked this route. We took the same route and actually I found it rather beautiful. However, the climb up from the Hillary Bridge to Gudel is very steep and then continues up to Sanam at 2900m. We walked with a delightful elderly 53 years old man who was married and had eight children, only four of whom survived. Three died in infancy and another daughter died last year in childbirth. He was returning home to celebrate the birth of his first grandchild. We left Sanam and climbed a further 500 meters to cross the Salpa pass (3400 meters), the border between Solukhumbu and Bhojpur Districts. The path follows a steep river valley, densely forested with rhododendrons and pine – a beautiful valley. From the top we had spectacular views of the Dudh Kunde Himal. After crossing the Salpa Pass we dropped 2500 meters to Salpa Fedi where we encountered a Maoist who asked for “Help” in the from of a “Donation”. Actually, we knew that there was a Maoist group operating here as we had met a Belgium tourist and his guide on the path who had warned us. When I asked the man his name he said “Ma Maobadi chu”- “I am a Maoist”!! When I told him about my “Noble Trek” and fund raising for BNMT he was happy that my donation was significant enough and we passed without making any “Non optional political donations”!! We left Dobhan for Bumlung and crossed the Arun River into Sankhuwasabha. I feel as if I am on the home stretch now in all very familiar territory. We stopped for lunch in Goothi Bazaar. At the hotel where we ate the wife had a severely disabled daughter of ten years old who looked about five years, She was evidently a birth injury and her limbs were terribly spastic but she had a beautiful smile and was obviously deeply loved and cared for by her mother. 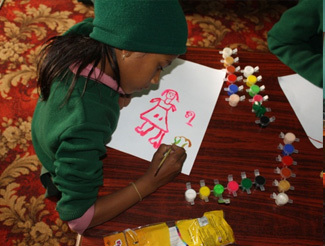 I have never seen such a severely disabled child survive in Nepal. Rosie’s birthday and the day we reached Sonam’s house in Bhotebas. We had woken up to a heated political discussion between local villagers on the state of the country and the rescheduling of elections-“Too many cats don’t kill the Mice”!! We walked to Chandanpur where we ate lunch. Pasang, Rosie’s porter is a tenant farmer in this village. Sonam and Pasang both come from north of Khandbari from an agriculturally marginal area so has taken the opportunity of farming someone else’s land in a more productive area. Had a day off at Sonam’s house in Bhotebas-Ablutions, washing and lots of Tongba Walked up to the ridge above the house to see if Makalu was showing her peak but we still have low cloud, so no mountains today. Still cloudy. We walked down to Khandbari, the district centre of Sankhuwasabha. It is one of those Bazaars which one can’t walk through without 45 cups of tea and lots of bunches of bananas from old friends! Visited the BNMT Office where we had a grand welcome from CM Ghimire (District Program Co-ordinator), Surendra Rai (Program Officer) and Rajan Regmi (Finance Assistant) who described the BNMT program in this District. 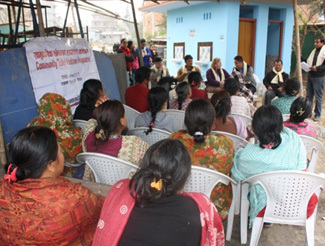 In Sankhuwasabha a two pronged approach is operated to improving health by working with the Government health services to strengthen their programs through training and providing medical equipment and working with local communities on health awareness and health rights – “The Rights Based Approach”. There are 39 health facilities in Sankhuwasabha and a BNMT Drug Scheme operating in them. This means that patients attending health posts receive medicine at 40% of the retail cost. But the Government has now decided that all health care must be provided free of charge. 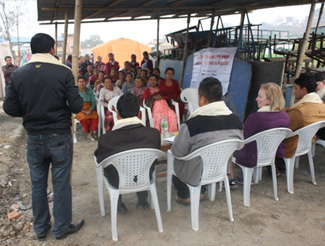 – Central interference with successful local programs in not unique to Nepal, we experience it regularly in England too! Today is “Nonami” and appears to be the day of the massacre of goats for the Dasain festival. As we passed through the villages of the Melemchi valley there appeared to be a goat slaughtered at every household, with the remaining live goats looking on with horror and bleating feebly. Melemchi river valley is the location of a new drinking water project for Kathmandu. As one looks north up hte valley one sees the stunning backdrop of the Langtang Himal range. We took a bumpy bus ride down the valley arriving late afternnoon in Kathmandu. Sonam managed to sleep the whole way. The Nepalis’ ability to sleep in the most uncomfortable situations has never ceased to amaze me! Seems the banks are closed today because of the Dasain holiday and the immigration office seems to open erratically during this period too. Bad timing! So I joined Uttam Phuyel’s family for a late lunch. Uttam is the operations manager at the Kathmandu Guest house and has been a great friend for many years. He is married with a delightful daughter and son (who was suffering with measles at the time, so a bit grumpy!). It was the first time I had met his parents. His father (recently retired) had been involved in road building in Nepal. His mother was so overcome by the fact I speak Nepali she proceeded to address all her questions about me and my trip to Uttam!! Later I met up with Shyam Shresta (a friend from England) and his “mit jiu” (best friend/blood brother), Shyam Tapaliya. They were planning a “six Shyams party” which sounded rather confusing! He suggested I visited his family home in Sankhu tomorrow and I could continue my trek from there (visa and cash willing) as it is only two hours over the hill from where I had left off. A bit quicker than taking the bus… ?! After a trip to the bank we headed to Lopsi Fedi to Shyam’s family home. Shyam grew up in a traditional Newar house on the banks of the Sali Nadi (Sali river). The Sali Nadi is the river which women come to bathe in at the Teej Festival (in September) to ensure they marry a good husband. I have obviously missed the opportunity this year!! Shyam had been contemplating building a more modern house for his family but has been persuaded that restoration and renovation of the original building is probably more worthwhile thus preserving both his family’s and Newar heritage in the valley. We watched a “lamo puchare” (long tail – a rather exotic sort of magpie) peck at persimmons on the tree behind the house while waiting for lunch. Rosie arrived today and met Pasang. Pasang comes from the same village as Sonam and will porter for Rosie. Pasang is 53 years old and currently undergoing dental treatment in Kathmandu. At present he has only one front tooth (new!) which is frequently on display as a result of his ear splitting grin! We had supper at the Dwarika hotel with a large group of Nepali friends. The Dwarika hotel features in an article I read recently as one of the world’s most interesting hotels. It is a relatively new hotel built in the traditional Newari style, originally common in the Kathmandu valley, with traditional Newari doorframe and window carvings. These were all reclaimed by Mr Dwarika, before he died, from old Newar buildings being torn down in Kathmandu in the rush to replace with cement. We dined in the Newari restaurant, Newari food is always very good, and had some particularly delicious plum chutney (lopsi ko achaar). Had a rather protracted visit to the immigration office today to extend my visa. As it is still Dasain holiday government office hours tend to be more erratic than usual and there were no immigration officers there until 11.30 am. Final preparations for our trip to Jiri included ensuring Pasang’s footwear was adequate. He is now the proud owner of a new pair of walking boots. It was quite challenging buying boots for him as his feet are almost as wide as they are long. In the meantime, Sonam has refused new boots as he is determined to complete his trek in his multipally repaired boots. They now look like a patchwork quilt! Headed up to Jiri. Jiri is the district centre of Ramechap and about 8-10 hours drive from Kathmandu on a road originally constructed by the Swiss. We passed through the village originally named “Quarry Stone” because much stone has been quarried from the surrounding hillside. Arrived in Jiri around 4pm and embarked on a city tour. We browsed through the goods in the bazaar and bought a large rainbow coloured umbrella for Rosie (the weather is still unsettled), some rope for Sonam, Pasang and Namadoj and a namlo. Namadoj had cooked for the group on the Jumla/Dolpo stretch of the trek. He is Rai from Solu Khumbu district and knows a short cut from Salleri/Phaplu to the Salpa pass which will cut out days next week. He will also porter for Jacky Spiby, another participant due out on the 27th. Left Jiri for Sahivalaya and Bander. Shortly above Jiri we came across a “ping”. Pings are erected across the hills around the Dasain and Tihar holidays. Constructed of four long bamboo poles with a swing below they are frequently located on a hilltop and command fantastic views of the surrounding countryside as one swings. We all had a go! After lunch at Shivalaya we headed up the hill and over the ridge where we encountered a group of Maoists requesting “donations” of 1000 Rupees for their election campaign. The “donations” didn’t seem very optional but after explaining the philanthropic nature of my trek they let me pass without payment. All the other tourists we met got through without paying the full rate. Tourists are obviously getting wise to this and as a method of fundraising it must be on the wane! Left Bander for Kinju, a rather attractive village on the banks of the Liku river. My first ever venture into the district of Saolu Khumbu, the home of Mt Everest. We headed up a long “na mitho ukalo” (bad uphill). Four hours up and 1200 metres. The path is full of school children portering goods from Jiri and Shivalaya up to Lukla and Namche Bazaar. It is school holidays out here at the moment and we frequently met 13 year olds carrying up to 40kg (girls and boys) for the trip which can take up to ten days. This would form and important contribution to the average annual income of the family. They are paid 50 Rupees per kilo for the whole trip. It is difficult to imagine children at home on such an endeavour! Professional porters here will often carry up to 100kg – more than double their weight. Left Goyam for Junbesi. Stopped at the Himalayan lodge en route; the pre-marital home of the women whose lodge we stayed in last night. There was a darling two year old boy sitting by the kitchen fire eating tsampa (Sherpa porridge) called Nima Sherpa. In fact he isn’t a Sherpa at all. His parents are both Tamangs but his mother ran off with another man and he was disowned by his father at 8 months old. Since then he has been looked after by this Sherpa family. The family have adopted him, after a fashion, but he will grow up in a servant role as a product of his unfortunate parentage. An educational sponsor could change all that and offer a him proper education. If his story touches you let me know as there is an excellent school a couple of hours walk away in Junbesi run by the Hillary Foundation which could be arranged for him. This would probably cost about 250 pounds annually and could change his life. We slept the night in the Edmund Hillary Suite at the Ang Chokpa Lodge in Junbesi and dreamt of climbing the world’s highest mountain with the world’s most famous mountaineer! Apparently he slept in our room on his last visit here about ten years ago! Left Junbesi for Phaphlu to meet Jacky Spiby who is due in this morning. Junbesi is a beautiful alpine style village on the Junbesi river in a rather prosperous valley in Solu Khumbu. One hour walk above the village is the large Thupten Choling monastery. A Tibetan monastery which has been extensively developed over the last ten years and has many students, nuns and monks, of Tibetan Buddhism. We had a beautiful walk down the Junbesi – Beni river valley to Phaplu, passing Pema Chiring Lama’s rather grand house en route. Pema Chiring was the government minister in Solu Khumbu some years ago and apparently had the airport moved from its original planned location to be closer to his home! Sounds a familiar tale. Jacky arrived from Kathmandu by plane, after circling the airport in cloud for several minutes whilst the pilot tried to located the airstrip. Very scary!! Walked from Dhunche (2030m) up to Lanabina (3900m). A beautiful walk through ancient pine and rhododendron forests where I saw two young deer (nilgar) on the path. We stopped halfway at Sing Gompa for lunch and some “seabuckthorn juice”. I had seen this advertised in the Manang valley but had not bee able to try it. It is produced from a small orange berry which grows on a thorny scrubby bush at about 4000 metres; in fact we had seen it growing in Dolpo. It is a very refreshing drink and worth the Rs.80 per cup we paid! In Lanabina we stayed at the Mountain View hotel where we should have had stunning views of the Langtang and Ganesh Himal range, but alas there was low cloud. I asked for a discount on the bill as there was no mountain view – in jest! Continued up the mountain from Lanrabina to Gosainkund (4380m). Gosainkund has a small lake . It is sacred for Hindus and Shiva devotees who make a pilgrimage on teh day of Junai Purne to bathe in the waters. There is a small island in the middle of the lake which is supposed to represent the head of Shiva. The lake is said to have been created by Lord Shiva when he pierced a glacier with his trident to quench his thirst after eating poison. The story is that the water flows from the lake through a subterranean channel to the Kumbeshwar temple in Pathan, 60km to the South. We arrived at 9a.m. and it stared to snow. After a quick breakfast we attempted to cross the Pass (4610m) in the direction of Helambu. The weather closed in and we were caught in strong winds, blizzard conditions and poor visibility forcing us to turn back. We arrived back safely at 12.30pm and sat out the storm in the Hotel Peaceful View with a Canadian who spent the whole time complaining about the standard of the lodges. The temperature in my room that night never rose above freezing, so maybe he had a point! Another group who attempted the crossing were not so lucky and didn’t make it to Gosainkund until 8.30 at night. It must have been terrifying for them. It stopped snowing last night and we decided to move with the other groups over the Pass. Less risk of getting lost! The owner of our lodge walked with us to cut a path through the snow in order to ensure we didn’t follow the tracks of the lost group who had arrived late last night. We dropped down through snow fields with gentians dotting the path. The Tamang people who live in this area say you should never pick gentians as you climb but you should pick them on your descent as a “thank you” for a safe passage. So we picked some and left a small bunch on the chorten at Fedi. After a lunch of boiled potatoes in Fedi we continued on a narrow path on a steep hillside. We went uphill and down a lot but never really changed altitude, passing through ancient rhodendron forests to the village of Tharepeti. First clear morning for a number of days giving stupendous views of the Pass we crossed yesterday. It is still heavily snow covered as is the Langtang range to the north (Gauri Shanker and Dorje Lakpa). We dropped steeply down to from Tharepati to Melemchigaon, a small Sherpa village which has benefitted significantly from the activities of “Community Action Nepal”, a charity started and supported by the mountaineer Doug Scott. The whole of the upper Melemchi valley is Sherpa and in Melemchigaon at the Gompa they were preparing for three day festival. All of the men were making “torma” – representative statues made of maize flour and coloured with red dye. Torma play a key role in many Buddhist ceremonies before being consumed with lots of “chang” (barley beer) by the festival participants. During the festival traditional masks will be worn with lots of singing and dancing. Unfortunately we will be unable to stay. We need to head down the valley to Kathmandu to pick up some cash and renew my visa. It seems my presence is required for a visa renewal and as it is the Desai holiday now I am not too sure how long this will take! Left Fedi (4200m) at 4am with Sonam (my porter of 10 years) to cross the Thorung La (5416m) before the wind got up. We crossed the pass at 8.30am after stopping for a ‘quick picnic’ of chapatis and boiled eggs at the snowline! There is a small tea shop on the pass where we had a much needed cup of hot chocolate! We headed down through snow fields to the ‘High Camp” (4850m) for lunch – before pressing on to the village of Letter – below the snowline – where we stopped at 2.30pm. Sonam had forgotton to borrow some sun glasses from a friend in Mustang – so I was worried about snowblindness again. We passed large numbers of Israelis and Russians along the path heading up – I explained to one group of Israelis that Nepali’s don’t like portering for them as they don’t tip! Hopefully their porter will get lucky. The whole way down – we were asked by the Nepali’s why we were trekking the ‘wrong way round’, was I sick?? or was there too much snow on the pass that we had to turn back – I certainly seem to be the only person going west to east! Continued down the river valley – spectacular views of Tilicho Peak, Gangapurna and Annapurnas 2 and 3. The news from Kathmandu is not good – – the strikes have started again in Kathmandu and the Terai. The Maoist party want the government to declare the country a republic before the elections in November. People living in the Manang valley do not support the Maoist cause as it has disrupted tourism so much over the last few years which brings in much needed income locally. We calculated that each tourist passing through with a porter spends around 15 pounds per day. Today we passed 167 tourists on the trail – ten times more than we saw in the first month!! It is a bit of a culture shock!! Left the village of Humde in the Manang valley heading for Chame. The Manang valley is a wide fertile valley dotted with Buddhist villages and enclosed by the peaks of Annapurna 1,2,3, Pisang Peak and Ganga and Julli. After passing through the village of Pisang,the valley narrows into a tight gorge. In the last two years they have begun to build a road through the gorge causing huge landslides and making the path treacherous in places. We arrived in Chame at 1.30pm in light rain and decided to stop and stay at the Sunrise Hotel. Chame is the district centre of Manang and quite a busy bazaar. Apparently they have internet here which I might try later. There is a police checkpoint here too so no doubt I will have to explain again why I don’t have a trekking permit! They didn’t seem very bothered in Humde yesterday!! Left Chame for the village of Tal. The density of tourists is increasing and we are seeing more of the two poles and lipstick brigade! Some of their day packs are a as big as my backpack. I wonder what they are carrying! Tal was our first night below 2000m and it was warm and humid; seems strange no longer sleeping in all one’s clothes! We met a couple of French climbers who are hoping to climb Ganga peak – but the weather is unsettled again. Three of their porters were complaining about their ’employment contract’ – most of the porters here get Rs400 per day (3 pounds per day) plus food and lodging. These guys were not getting food and lodging and since a basic daal bhat costs Rs270 up here – on two per day (Rs 540) they were obviously going to be out of pocket. I spoke with their Nepali mountain guide about it and he did not seem overwhelmingly sympathetic – but we did finally manage to negotiate food/lodging and shoes for them! Today was the day that my boot began to fall to pieces seriously – I know that I have covered quite a distance – but I would have expected it to last more than 36 days! Hopefully I can get it repaired in Besisahar – the next big town. Continued down the Marsyangdi river valley. There are some spectacular waterfalls cascading into it and the path is very narrow in parts. It is hot and very humid. Stopped for lunch in Ghermu. We were joined by a large group of Polish people who settled in to a liquid lunch of Tuborg lager. Not sure that tourists, porters and many mule trains – taking goods up the valley. The mules wear metal muzzles to stop them biting each others loads apparently! and some of the porters were carrying 100kg – (metal piping for a micro hydro project) – staggering! We stopped for the night in Ngadi. Walked one hour down the valley to the village of Bhulebhule where we saw our first vehicle for 6 weeks (excluding the motorbike we saw at Tinje on Sep 24!). We were tempted – but resisted the ride and walked another two hours to Besisahar! There are stunning views of Lamjung Himal behind you as you walk down the valley. Arrived in Besisahar at 11.30am and checked in to the Annapurna Hotel which has obviously seen better days. After complaining about the general lack of cleanliness, we headed into the bazaar to find a Sarki (cobbler) who reattached the sole of my boot for Rs15 (10p)! We arrived back at the hotel to find a concerted effort at cleaning going on – I wish my suggestions always precipitated such immediate action!! We are waiting for Gamba (our guide) to arrive from Kathmandu to take us cross country to Trisuli. Rest day in Besisahar. Began with a funeral – a 24 year old woman following a caesarean section for her first child last night. Her baby boy lived – not sure of the precise details – but they have a new Doctor here, who I guess must be feeling a bit nervous now. Just goes to show the dangers of child bearing here are still very real. I guess the outcome for her son is probably not that great either. Very sad. This evening was ‘load shedding’ at the hotel – which means that there was no electricity for two hours at peak time between 6-8pm. Many towns have outgrown their electricity supply which means at peak time it is rationed (in sectors on a rotational basis). A Spanish guest at the hotel who is responsible for the electricity supply in Alicante wondered what the residents there would make of such a practice! Tried the Sat phone here – which just when you don’t really need it has an excellent signal! Normally when I call in with my blog it takes about 15 calls as the signals have up till now always been very weak! The November elections have been suspended. Gamba arrived from Kathmandu and we headed down the Marsyangdi river valley to Luitel Bhanjyang anf Gorkha. Luitel Bhanjyang is the home of BabuRam Bhattarai – the chairman of the Maoist party and one of the leaders of the ten year insurgency. Upendar Devkota – the country’s leading neurologist also comes from this area and both went to the local high school here. It was difficult to ascertain the views of the local people here on the politics of one of their local lads except that they are mainly Nepali Congress here – which may tell us alot! We ate a delicious lunch at the home of Uma Shrestha. She told us about her sister in law, who got pregnant as an unmarried teenager (teenage pregnancy seems to follow you everywhere!) by one of the local high school teachers. He ran off and she was left with an illegitimate son, no chance of marriage, her life essentially finished. Fortunately her family did not throw her out. Five years later her son had started school and a Belgian trekking group passed through the village (this is now 11 years ago). One young man – moved by the plight of the young boy’s situation – undertook to sponsor him. The boy has now finished school and is studying engineering at one of Kathmandu’s top colleges. The Belgian sponsor returned for the first time last year to meet with the family and will come back next year with his wife and own son! So some tragedies here have a happy ending! Visited the old fort and palace in Gorkha this morning. These were built at the beginning of the Shah dynasty in the early 1600’s by Ram Shah. His son, Prithi Naryan Shah, was responsible for the unification of Nepal. The current royal family are direct descendants of this dynasty. The fort and palace (and the temple of Kali) command a spectacular hilltop position and are an extraordinary feat of engineering. One is supposed to have great views of the Manaslu Himalaya form here – but it was cloudy and we saw no mountains. We walked on to Arughat – a riverside town on the banks of the Buddhi Gandaki where we overnighted. Nepal is building the Mahendra highway up this river valley as a second route to Tibet. Apparently Prachanda – the other leading intellectual in the Maoists party besides Baburam Bhattarai – used to teach at the school here and our hotel owner remembered being taught by him! En route we passed a young cow on the path who had fallen off the hillside – and I suspect had received some fairly drastic bony injuries to his back legs. The owners were planning to carry it home and call the vet – I suspect the prospects are not very good – and of course they will not be able to put it out of its misery – because of their Hindu religion. We also passed two trekking groups who had been camping at Khoanath and been ‘held up’ by bandits last night – and robbed of Rs70,000 each – I was rather glad we were staying in a lodge! Walked from Arughat to Tharpu Bhanjyang – beat the bus to Chissapani (which Gamba was on – returning to Kathmandu) – apparently it had got stuck in mud in Sallyantar! In fact it didn’t look as if it was going much further either as there was a long queue of trucks and buses parked on the road to Fhading unable to get past a broken down truck. Apparently they had been there since last night! Sonam and I headed up the Ankhu river beofre cutting up and over the hill to Tharpu – a long hot haul up! Sonam spotted in a copy of ‘Tourism News’ an old photograph of Rosie Blandy (joining me in Jiri) and myself – illustrating an article titled ‘Tourism Keeps its Shine’! Not sure how appropriate that was!! There is also an article ‘British Doctor on transhimalaya trip’ – but no photo! Today Supersonic Sonam (my porter) became Super Sodden Sonam – while trying to negotiate some particularly wobbly stones across a river – he slipped and was thigh deep in water! A bit unusual – as Nepalis are very sure footed! Fortunately no damage was done and after a lot of wringing out of trousers and emptying boots of water, we continued on our way to Trisuli – a large bazaar on the Trisuli river just north west of Kathmandu. We had unseasonal rain today – which is fine for walking but not great for views/photography. After passing through Trisuli we headed north into the mountains again to try and avoid the heat and humidity of lower down and stopped for the night in Kalikasthan. Today was the first day of Dasain – the big Hindu festival – it is only eight days now until Tikka day – when elders give tikka, flowers, food and money to the young. Walked from Kalikasthan to Dhunche – the gateway to Gosainkund and Langtang. Very little traffic on the road. The weather had cleared and we had fantastic views of the Langtang range. The road has taken a battering during the monsoon and there have been some big landslides which had been cleared after a fashion by the Japanese bulldozer! As we got close to Dhunche, we were met by large flocks of pink sheep and goats. A bit surreal. They were all different shades of pink. Their owners way of distinguishing between flocks! They have been brought down from Tibet to sustain Kathmandu’s requirements for meat during the Dasain festival and will be trucked down over the coming days. A bit like Turkeys at Christmas! We intend to take the route through Gosainkund, cutting through to the Helambu trail and then east to Chautara before heading up to Jiri.